A cookbook resource co-created with teachers and students to connect nutrition, gardening, and cooking to classroom lessons. While I was teaching gardening and nutrition in Atlanta Public Schools, I found that the resources available there did not meet the needs of the students and teachers I worked with. Most farm-to-school resources have been developed in places like Vermont and California and were often not focused on low-income populations like the ones that I worked with. I decided to work with my teachers and students to co-create a cookbook resource specific to their needs and wants. This was a self-initiated project during my public service years with FoodCorps and Captain Planet Foundation. I found that a lot of the farm-to-school recipes that were available did not quite fit with what my students had access to—I was teaching in Atlanta Public Schools, and many of the schools I was teaching in simply did not have a lot of the resources to buy those complex ingredients. This project was my first foray into user-centered design. It’s what got me interested in UX! How can we design a resource that can help teachers and students connect cooking and gardening to classroom lessons? What do teachers want in their resources and how do students learn best? I learned exactly how teachers and students wanted to learn how to cook in the classroom, and I then designed and created a printed resource booklet filled with teaching tips, pantry lists, and recipes specifically created for my students. My organization printed hundreds of copies of the book, I led workshop trainings using the book, and now teachers all over Atlanta (and other states) use the book as a resource for teaching cooking and nutrition in the classroom. I lead classroom cooking lessons, planned lessons, worked with teachers to figure out what would help them cook more in the classroom, cooked, tested recipes, tested more recipes, grew veggies, photographed, designed, illustrated, and wrote the entire book. The book was funded, printed and is now used by teachers all over metro-Atlanta (and many in other states, too!). Learn about your users! Sometimes, it can be useful not to design just for them, but design with them. Especially with kids—it’s so fun! Personal, self-started projects are special, but sometimes they can be hindered by other stuff going on in your “real work.” Make time and space to finish your project. After a year of teaching gardening and cooking in Atlanta Public Schools, I started to realize that the recipes and resources available out there didn’t quite match the needs of the students and teachers I worked with. A lot of these farm-to-school recipes were created in Vermont or California and, well, I was teaching in the heart of the City of Atlanta. Ingredients were often inaccessible to students I worked with, recipe steps too long and involved for the allotted class time, and students just plain didn’t like many of the recipes. Wanted more process structure: step-by-step instructions on cooking, what pantry items to have, etc. Simple recipes: class is only 50 minutes. Factoids: tie recipes back to science, history, or culture curriculum. Cheap ingredients! Teacher budgets are small. Simple: if recipes were complex, they forgot it. If you printed it out for them, it lives in their backpack for a year. Simplicity meant they can learn it by heart and do it. Tasks (or tools) that students can use. Students wanted to learn how to use a knife. Can’t really bring a knife to school, but how can we still teach that? From there, I had to develop recipes, resources, and procedures. I did this with my teachers and students: I would come up with a really basic recipe, then I would co-teach the recipe in class with the teacher, the students would cook it, and then they would give me feedback. We iterated on each recipe many times, and the classroom became a test kitchen where we learned about chemistry, nutrition, and how to make our recipes better. With teachers, I learned about which recipe instructions worked and which didn’t, where their knowledge gaps where and where they wanted to learn more—this helped me come up with resource pages for the teachers: how to lead a classroom cooking lesson, what pantry items to buy, why even cook in the classroom, and more. Greens and produce from the garden being processed by students—ready to be cooked! For the design of the book, after talking to my teachers, we wanted something that was approachable. We did not want it to be “professional” in the sense that photos were staged or everything looked beautiful and was perfect—that simply isn’t how the classroom worked. And so, I handed my camera to the middle school students during cooking lessons, and the photos that they snapped became part of the book. For an even more playful feel, I used handwritten notes for the factoids, mirroring the handwriting of students. Text was large to be able to easily be read while cooking, and then I illustrated a handful of veggies (looking like construction paper cutout) for the cover and certain sections of the book. An early iteration of the resource booklet. 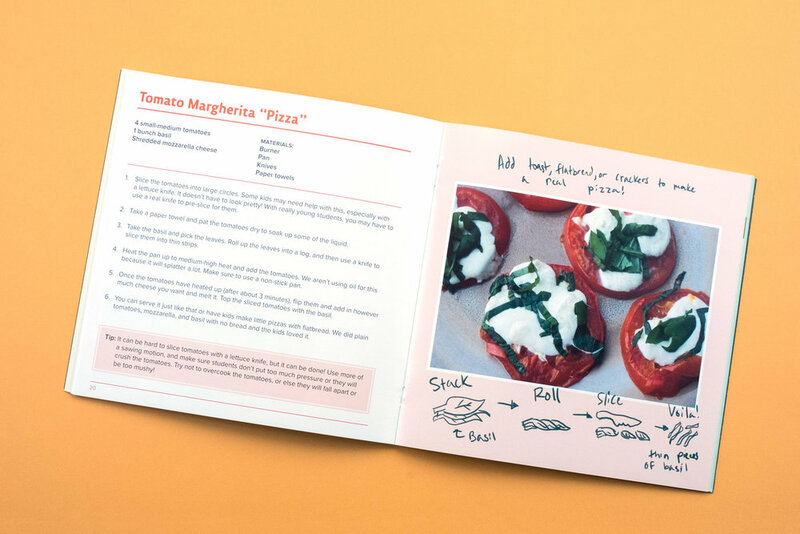 After feedback from my non-profit organization and teachers, I changed the design to be one recipe per page as well as added handwritten text for a more playful and school-like appeal. In the end, we had a booklet that was co-created with the end users—resources, tutorials, and links to standards the teachers requested, student-lead and tested recipes (and photos! ), as well as one darn tasty “hot sauce” recipe we made from peppers growing in the school garden. 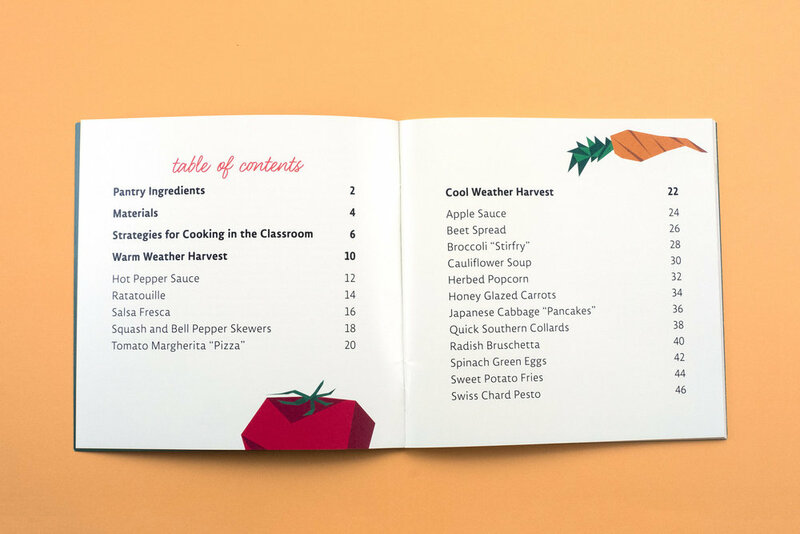 Captain Planet Foundation and FoodCorps ended up printing hundreds of copies, and now it’s given as a resources to schools and teachers as part of the Captain Planet Foundation Learning Garden cooking kit.